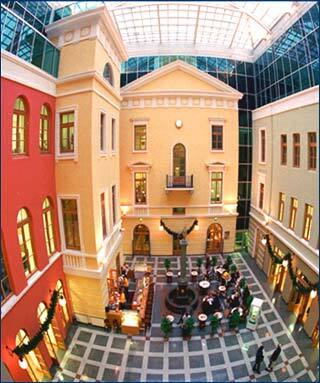 The Atrium at Nevsky 25 is a modern mixed-use development (retail and office) that has preserved the historic heritage for which St. Petersburg is so famous. The entire building was reconstructed to Western specifications, including computerized building management systems, full air conditioning and independent heating and state of the art fire/life safety systems. Throughout the design and construction process, sensitivity to the unique architectural heritage of the building was retained, historical details were restored, and the distinctive interior atrium environment was created. Professional engineering and janitorial personnel.  8, 000 Rentable Square Meters.  2, 700 Rentable Square Meters.  5, 300 Rentable Square Meters.